Loaded with history, tended by exemplary hosts, sleeping in comfortable rooms, and dining on delectable breakfasts catering to your every whim... did I catch your attention? These are just a few highlights of our weekend at the Maxwell Creek Inn Bed and Breakfast in the Sodus, NY area. My first ever visit to the state of New York found me shivering in 42º temps on the chilly shores of Lake Ontario and experiencing spring for the second time this season. So different from my bustling (warm!) San Diego home, the Maxwell Creek B and B served as a peaceful haven for our weekend stay in the Sodus area. 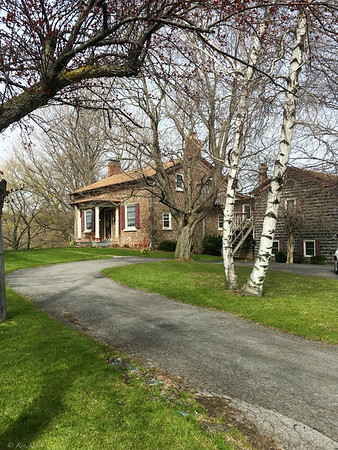 Just outside of Sodus Point proper, this lovely B and B dates back to 1846 when William Swales built the home for his daughter Elizabeth and her new husband Mr. John Preston as a wedding gift. 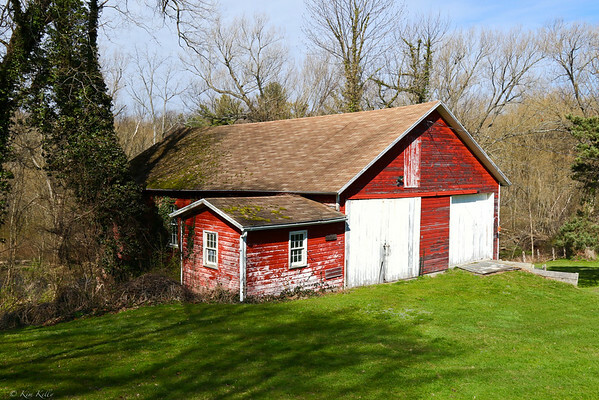 Covered with round, lake-washed cobble stones, the house makes quite a statement along with its original carriage house (now turned into guest accommodations for families, groups and extended stay guests), gorgeous grounds and big red barn. The happy Preston's bore 7 children, and this historic home stayed in the family for nearly 150 years. With our visit in early May, apple blossoms were just popping from trees on the grounds and daffodils smiled brightly in greeting around the home's front entry. Smiling even more brightly, owner Belinda McElroy, made us most welcome from the first hello. Giving a short history of the house and a quick tour, we somehow felt transported some 170 year earlier to Elizabeth Swales' home. Filled with antiques, it wasn't hard to imagine ourselves back in the mid-1800's. Most notable in the home's history is the rumored connection to the Underground Railroad. Recently named a local "Legend and Lore" Historical Site, the home's 6 acre grounds back up to Maxwell Creek and Maxwell Bay where small schooners sailed in to trade wheat for flour milled at Preston's Grist Mill originally built in 1794, and then rebuilt after being washed away in 1812. It's said a tunnel ran from the creek to the fireplace in the back of the main house where slaves would hide until they could board ships across Lake Ontario to Canada. 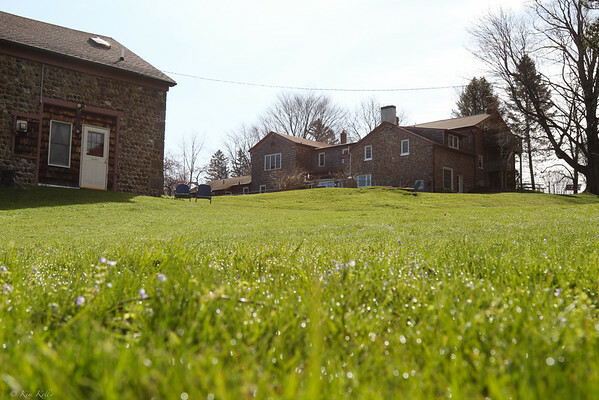 Today, the Maxwell Creek Inn boasts five guest room accommodations in addition to the Carriage house which houses families and long stay guests. 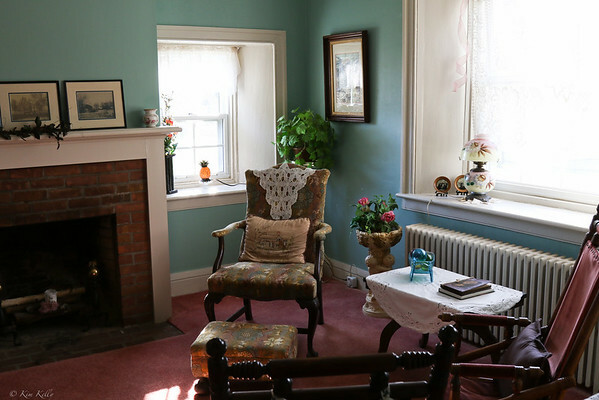 Two comfortable sitting rooms in the main house feature bright windows, comfy chairs and a tv available for all guests, and the dining room (used to be called the "keeping room") can be found on the bottom level. With coffee available all day in addition to irresistible home made cookies (I had at least two a day! ), Belinda has thought of everything. For our recent stay we laid our head in the Gaylord Suite, the largest of the five available guest rooms. 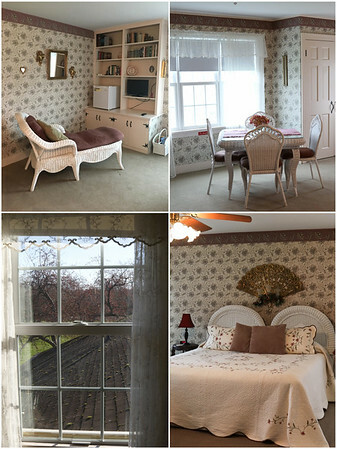 Originally the Gaylord Boys' Dorm Room, this room features a large picture window overlooking Maxwell Bay and apple orchards along with peeks of Lake Ontario. Furnished with a King sized bed, sofa, chaise lounge, and tv, the suite boasts a private bath with shower (no tub). 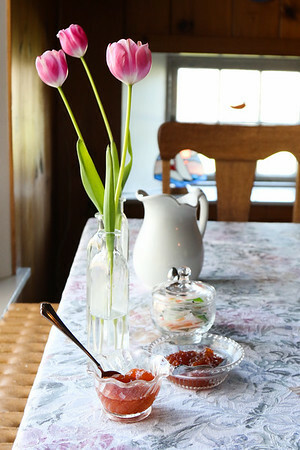 In addition, the room holds a dining table for four where guest may have breakfast served in their room upon request. For us though, we looked forward to breakfast in the dining room with the historic fire place and views overlooking the grounds, part of the creek and the old red barn. Which brings us to the breakfast part of the stay. Belinda checked with us before our arrival for any special requests or dietary needs, and our request for a diary-free meal was met with no issue and was at the time of our choice. Refreshing our palates with freshly squeezed orange juice, the second course arrived featuring a tempting veggie frittata served with sliced tomatoes topped with feta and sliced basil. Two slices of hearty homemade English Muffin Bread rounded out this mouthwatering meal, and we found ourselves already anticipating breakfast the next day. And it was that second day that left Liv begging me for a trip to the Inn. 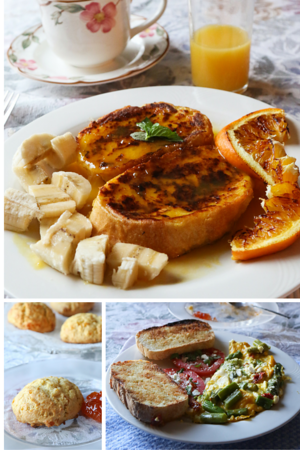 Orange French Toast served with chopped bananas and broiled orange slices all sort of melded together with a delectably sweet orange syrup. Photos immediately made their way across the country and onto my facebook page as I may have boasted how lucky I was just as Liv removed yet another frozen waffle (I did make them for her before I left!) from the freezer. As we were the only visitors on our stay, I took a moment to peek into the other guest rooms before we left. All rooms look comfortable and inviting, and many feature king sized beds with private baths, and one room on the top floor offers a twin sized bed in addition to a full-sized antique four poster. Charming, comfortable, beautiful and historical, the Maxwell Creek Inn made our visit to Sodus, NY even more special than expected. Many thanks to Belinda for the extra special touches that made us feel so welcome. Liv Life Note: Note that Liv Life did not receive any incentives to write this post and the Maxwell Creek Inn did not know we would be writing about our stay. We simply had such a wonderful visit I wanted to share! I grew up about an hour from Sodus Point, and this area is beautiful. Maxwell's sounds like a lovely B & B too! It is the most lovely B&B!!! And wow Julie... what a wonderful are to grow up! My husband still has family there and I'm looking forward to many more visits!! Thanks for posting this! We have relatives in that area and it's always nice to read a first-hand account. The food really looks amazing! Isn't it a wonderful place to visit? If you have a chance, request that French Toast!! I'm still dreaming of that orange scented syrup! It looks wonderful there. 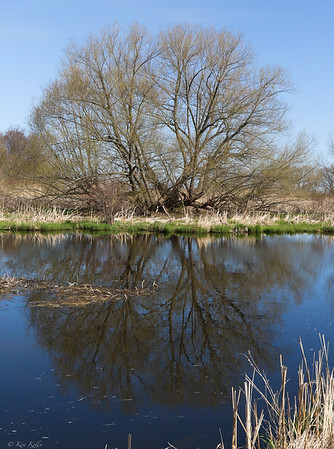 So calm and peaceful. Thanks for writing about it. The breakfast liked delicious. I love historical inns like this! So cool. And the homemade cookies would be a winner for me, too.